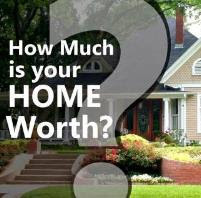 2012 is shaping up to be a pivotal year in real estate! Both low interest rates and low prices paint an optimistic picture of real estate but is this the year the market bottoms? 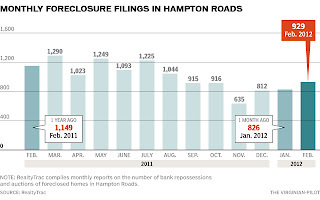 On the one hand we see visible inventory decreasing, but on the other hand foreclosures are again on the rise. What does this mean? Before we get to these answers let's take a look at local numbers to see where we are; below is a chart showing the most recent absorption rate (months supply of inventory) for the 7 cities of Hampton Roads (from REIN MLS February, 2012, statistics). 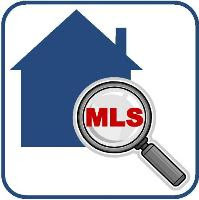 Absorption rate is the amount of time it will take to sell all the homes currently on the market at the current sales rate provided no new properties enter the market. Four of the seven cities show a decline in inventory from the prior month indicating that we are moving toward a more balanced market. Activity is most brisk in Virginia Beach which boasts the lowest absorption rate. 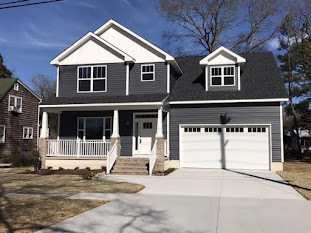 However, the absorption rate has increased in Chesapeake and Suffolk indicating a growing inventory while Newport News has stayed the same from the previous month. Given the numbers in the chart we can safely say that the trend is toward a decrease in visible inventory. Now what about the invisible inventory, the shadow inventory, of homes that have yet to hit the market? According to a Virginian Pilot article from 3/15/12, foreclosure filings have increased in our area. Banks are starting to release more of their inventory and what this market has taught us is that the presence of distressed properties will further depress prices since these homes become comps (comparable sales) for all other homes in the neighborhood once they sell. The impact on prices is neighborhood specific as some areas have a heavier presence of distressed properties than others. However, Celia Chen from Moody's Analytics predicts that with the advent of the latest bank settlement and subsequent increase in foreclosures prices will drop another 3% nationally. So coming full circle to our question in the beginning of this post, "Is this the year the market bottoms?" The most accurate answer is maybe or maybe not because no one can say with 100% certainty whether we've hit bottom. The better question to ask is "What is the opportunity for me and my family to buy a home in today's market with high housing affordability, low prices and low interest rates? And what is my opportunity cost if I choose to wait?" Only you can answer these questions, but opportunity waits for no man (or woman!) and one thing we know for certain is that as with all cyclical markets, prices and interest rates will eventually rise. What will you choose to do?